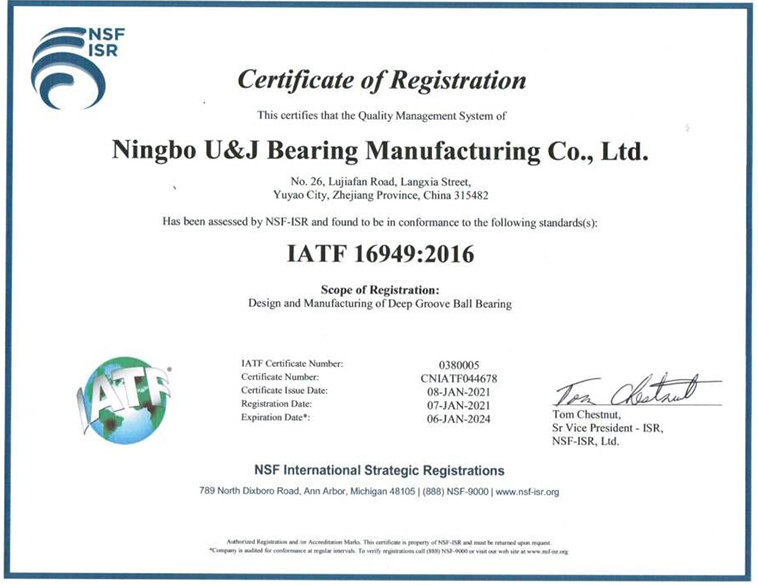 Ningbo U&J Bearing CO. Ltd. is a professional bearing manufacturer producing deep groove ball bearing with high precision, low-noise. The company is located in Zhejiang Yuyao Industrial Park with superior geographic atmosphere, and convenient transportation by sea, land and air. It owns the authority to import and export itself. The company boasts the advanced production line of automatic precision bearing grinding machining, assembling, cleaning, grease-injection line and the whole set of superior precision bearing testing devices. The precision devices, the advanced production techniques and scientific quality-control system guarantee the high precision, low-noise, long service life and stable quality of U&J bearing. U&J bearings have been widely applied to many fields, such as motorcars, motorbikes, electrical household appliances, textile machinery, agricultural machinery, miniature electrical machinery and so on. 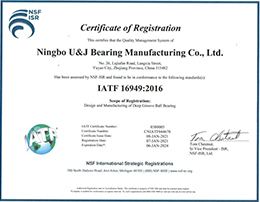 U&J Bearing is ISO 9001:2008 certified company . From year 2014 we proceed ISO/TS 16949:2009 management system certified from USA NSF-ISR organization.TS16949. Welcome all the clients from home and abroad to U&J to inspect and cooperate with us. We would like to provide you with high quality products with reasonable prices and the high efficient services.